This week Kenny and his team have created a charming and eye-catching babysitter layout pack. 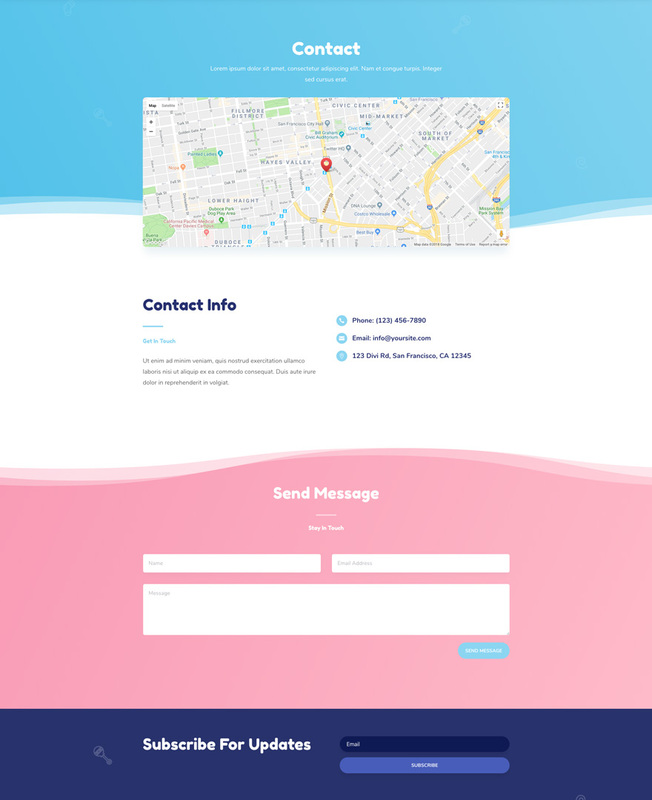 This layout pack has eight different layouts and uses a soft color palette that brings the website to life. 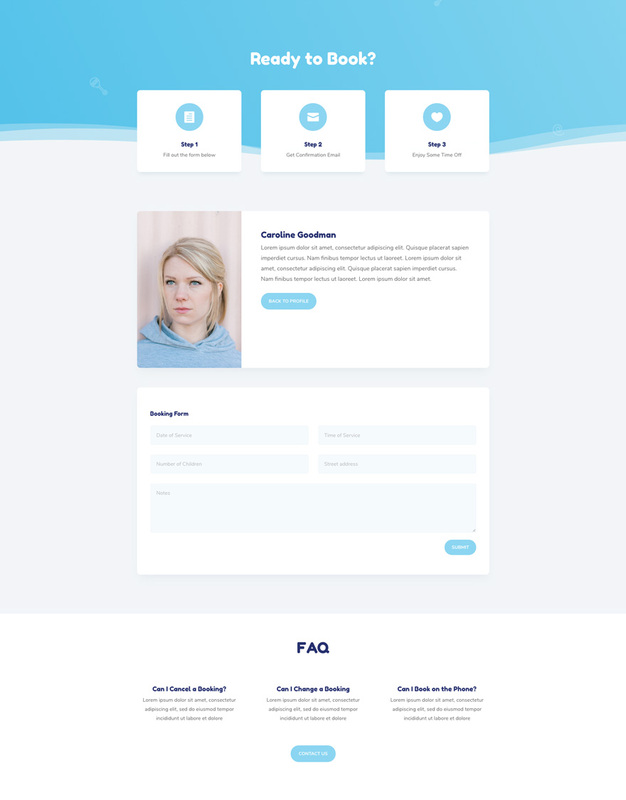 Within each layout, beautiful section dividers have been included that give your babysitter website the finishing touch you need. 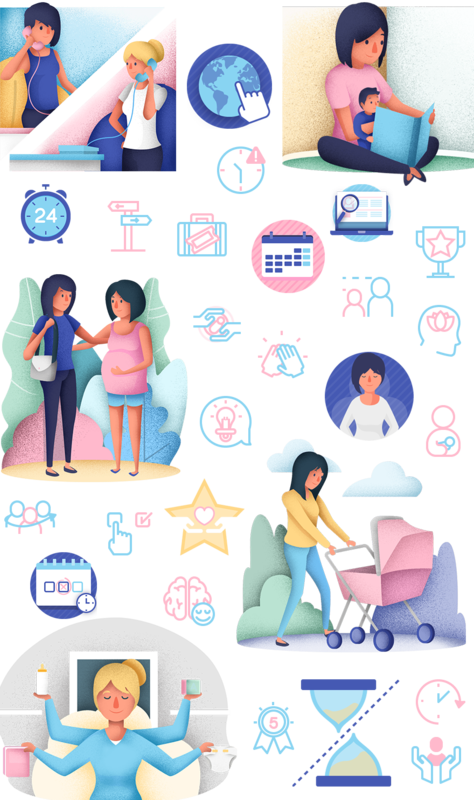 The Babysitter Layout Pack contains eight different and unique layouts. On top of that, it has a ton of icons and illustrations included that match the color palette of the layout pack perfectly (and which you can use without any restrictions). You can also find beautiful section dividers within each layout that make your website look sophisticated yet simple at the same time. To access your new layout, simply activate the Visual Builder when editing a page and look for the “Load From Library” icon in the page settings bar (it looks like a plus symbol). Click this icon to launch the Load From Library popup. Under the Premade Layouts tab, you can easily find the new layout by scrolling through the list of layout packs. Once you find the Babysitter Layout Pack, click on it. You will see all the individual layouts included in the pack. Select the layout you want for to use and then click the “Use This Layout” button. 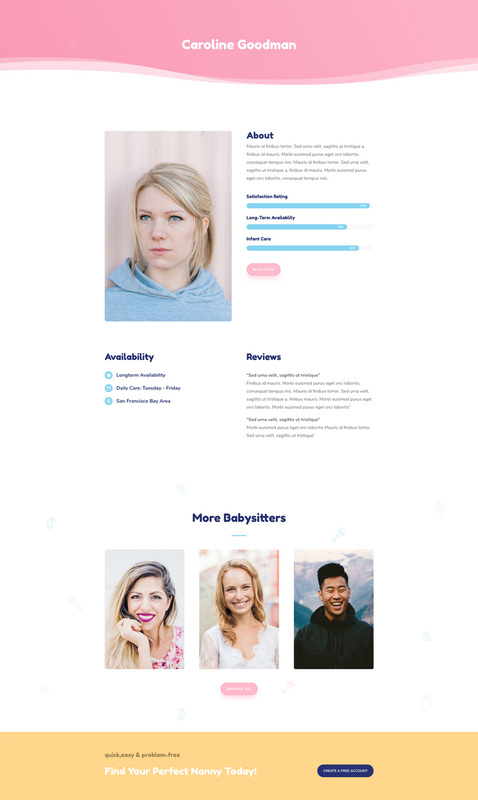 We hope you enjoy this babysitter layout pack. 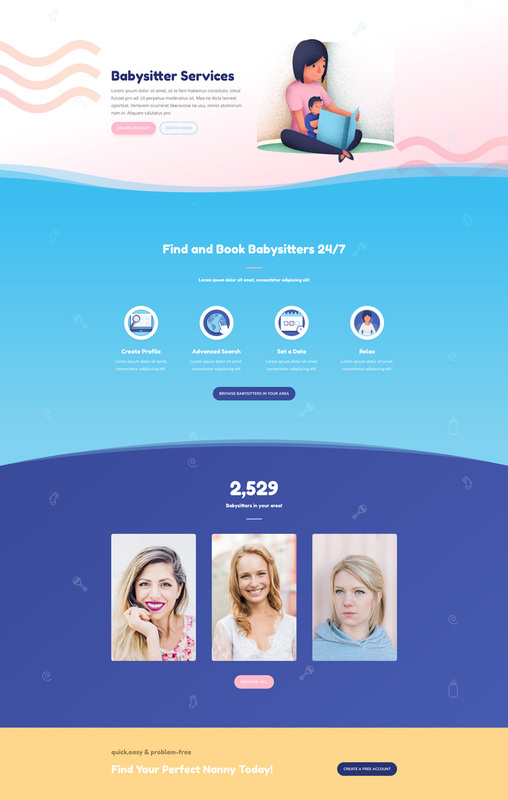 And to help ensure that you do, we’ll be doing a live stream on our Facebook page this Tuesday at 3pm EST to walk through how to add reviews to babysitter profile pages. See you there! Congrats to Kenny and team. Another nice layout with some great graphics. 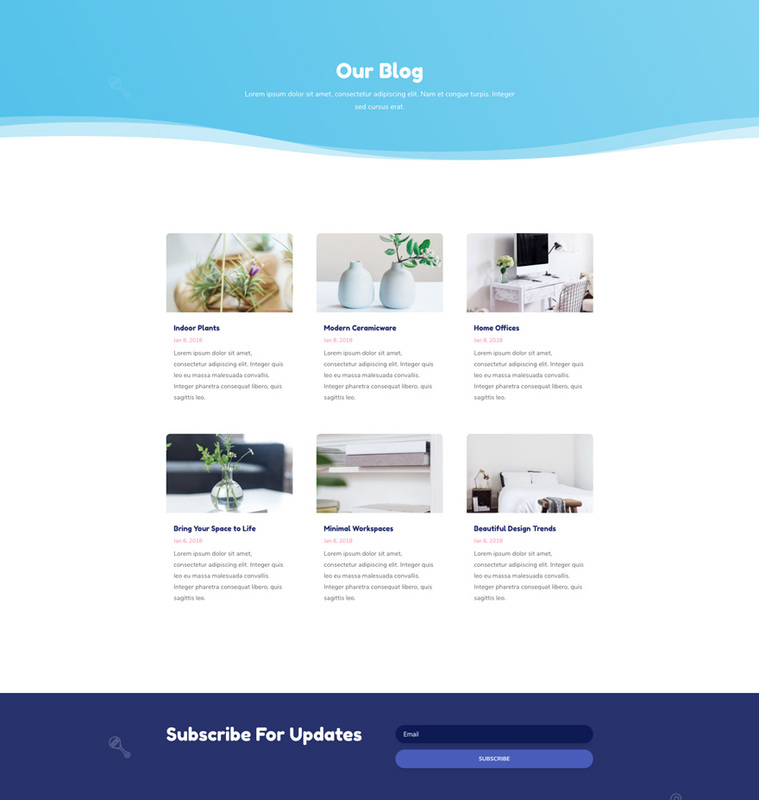 I wonder if the people at Elegantthemes would revisit some of the old DIVI layouts they created with graphics and give us some new graphics for it??? Another good looking theme, thanks! Any chance you’re working on a ‘Financial/Bank’ theme? Very creative, great add to the library, thank you. Who designed the drawings? sooo good! “Professional Care” is misspelled in the babysitter template. I just noticed this and figured I’d point it out incase it helps. Amazing! Many thanks for all your efforts and creativity. I wish you added a newspaper/magazine layout pack too. I don’t think this will ever come, since this means they would have to work on their blog layout/design functionality, an area in desperate need for more functionality – just like header/navigation and footer. Elementor page builder is simply faster to implement these essentials. These layout packs on offer here are all nice looking on first sight, but they are flat designs with static content only. This is great! I am creating a very similar site I wish this was available a few months ago. I have a question, with my site that I’m creating I have to set up a membership site, I am assuming with this site the designer would also have to set up a membership portion of the site. Is this correct? Great use of the shape dividers. I’m glad you guys are hitting just about every niche. I love the design, colors, typography and the overall style. More inspiration for me! Very nice layout as all previous were, but i hardly find any help dedicated to biotech science or agriculture even within divi child themes. The best i could find is clinic based child themes and gardening. I am building several subdobain websites for agricultural products, biotechnology and nutraceuticals. I woul really appreciate ET to support with more science and bio industry oriented layouts. I personally have to build everything from scratch. Thank you in advance and keep up the amazing work! While you have these icons designed, why not make them into a font set to be used on other projects? Nice, but how would you recommend to get any actual functionality from the website ? Which booking plugin / system could be used? Wow Fantastic Super Cool .. This looks great. Very different from what we usually get but still very valuable and well designed. I will be developing websites for Christian churches and would sure appreciate it if you could offer a library pack for that genre.